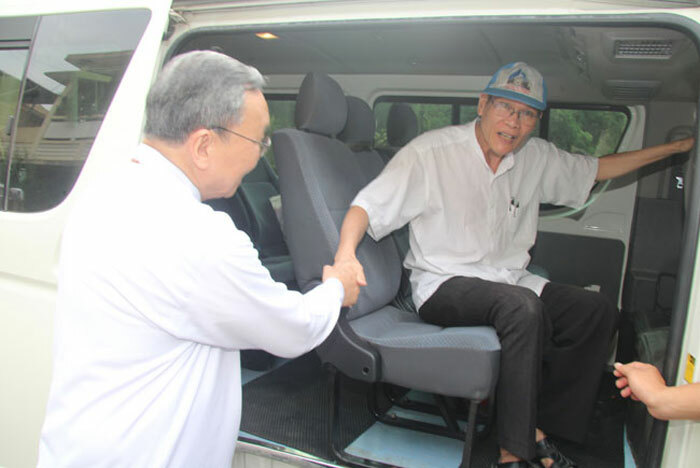 Catholic priest and prisoner of conscience Nguyen Van Ly is shown being helped out of a vehicle after his release from prison, May 20, 2016. In an apparent goodwill gesture ahead of President Barack Obama’s state visit to Vietnam, Hanoi released a 70-year-old Catholic priest and prisoner of conscience on Friday as human rights activists urged Obama not to overlook their cause in his meetings next week. Catholic Priest Nguyen Van Ly was tried in 2007 and convicted on charges of conducting “propaganda against the state” and sentenced to eight years in prison and five years on probation for violating Vietnam’s notorious Article 88 of the penal code. His release was announced by the Catholic Archdiocese of Hue. Catholic Priest Phan Vam Loi told RFA’s Vietnamese Service that nearly two decades in prison had taken their toll. Ly’s latest stint in jail was not his first. As the co-founder of Bloc 8406, a coalition of Vietnamese political groups that advocates for democratic reforms, he has been targeted for some time. He was arrested in 1977, 2001, and 2007 for various crimes against the state. While prison has taken its physical toll, Ly is apparently unbowed. Nguyen Van Ly is also under no illusions as to why he was released, Phan Vam Loi said. “They told Ly that this is a pardon from the state’s president, but Ly told them that this is not a pardon but a gift to the U.S. before the U.S. president visits Vietnam,” Phan Vam Loi told RFA. “Besides I’m not guilty so you can’t pardon me,” Loi quoted Ly as saying. Nguyen Van Ly’s release highlights a key conflict Obama faces in Vietnam. As ties between the two former enemies grow closer, Vietnam’s wish to keep China contained in the South China Sea dovetails neatly with the U.S. desire to ensure the vital seaway stays open. While Vietnam wants the U.S. to eliminate its arms embargo against the country, and Washington seems willing to approve more arms sales, Obama also wants to Hanoi to undertake human rights reforms. White House officials say that during the visit that officially starts on Monday, Obama will meet Vietnam's new president, Tran Dai Quang, as well as its new prime minister, Nguyen Xuan Phuc, and Communist Party General Secretary Nguyen Phu Trong. While he will also meet with top government officials, Obama is also scheduled to meet with dissidents and deliver a speech to the Vietnamese people. “On Tuesday, May 24th, the President will have a meeting with members of Vietnamese civil society as he does in countries around the world,” Deputy National Security Advisor Ben Rhodes said on Friday. While he stopped short of saying there is a human rights quid-pro-quo in the arms sales decision, Rhodes said the administration is looking at the U.S.-Vietnam relationship holistically. Vietnamese blogger Le Dung in Hanoi told RFA that some activists have gone to the U.S. embassy in Hanoi to ask about Obama’s visit and asked to meet him to talk about human rights issue and were assured there would be an opportunity. While Catholic Priest Nguyen Van Ly’s release could be read as a positive sign, other rights activists expressed doubts that Hanoi would undertake any real change. While rights defenders are concerned that the visit will change little, activist Thuy Nga in Ha Nam province told RFA that external pressure could have an impact. Reported by Gia Minh and Hoang Dung for RFA's Vietnamese Service. Translated by Viet Ha. Written in English by Brooks Boliek. How shame of you ? You could win the war with America your enemy, but your peoples expect at your enemy to give them to be free from your grip.Even if you could purchase high tech weaponry from US, but where is your stand point ? Today, your peoples expect from President of America tomorrow your peoples will expect from China, because you have nothing for them.